A dark blue flag with the city seal in white. Ibrahim M Stwoda, the former Librarian of the University of Kabul, reports that the banneret of the university is badly faded. According to Mr Stwoda, the color of the flag is actually a light blue, but there was no real standardization of colors so that he has personally seen the flag in everything from the color of the United Nations flag to almost an Air Force blue. The flag is, in his words, a 'standard rectangular shape', but he doesn't provide actual dimensions. The seal of the university also appeared in various formats; on the banneret the open book was dark blue, with the surrounding decoration in a lighter color, and this version also appeared on the flag. However, there was another version of the seal in which the entire decoration of the seal was open. In both cases the seal was in white. 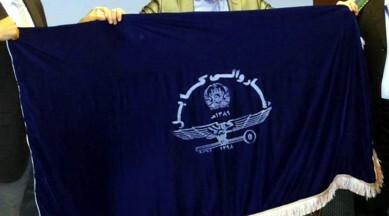 This flag was in use from at least 1946 until the overthrow of the monarchy. 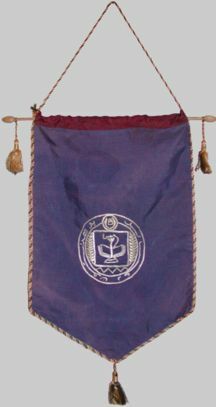 There were also subsidiary flags used by various university officials - the Rector had a personal standard which was square shaped, with a golden fringe and the seal in gold; Mr Stwoda says that the Deans of the various faculties were likewise authorized to display a similar standard except that the fringe and seal were in silver, although he does not ever recall having seen one actually being flown. The Cadet Corps, which all male students were required to join, had the university seal superimposed on a saltire of crossed swords. He did not however provide any description as to the shape of the swords. Mr Stwoda states that he has no idea whether the university used any flags during the period from the fall of the monarchy to the Taliban ascendancy as he and his family fled the country immediately after the Soviet puppet regime was installed. The university was for all practical purposes closed under the Taliban, and since their overthrow the university authorities have been more concerned with getting the University of Kabul into normal operations than in considering any matters relating to flags.